The Rena AS-150 is the latest low-cost envelope and seed pack printer in town! Altho the Rena AS-150 was originally designed with seed pack printing in mind, it can do so much more at an affordable price! This small footprint unit has a low price to match its small footprint! MSRP $6,995! A price that is rarely seen in the new address printer market! But don’t let it’s small size fool you. 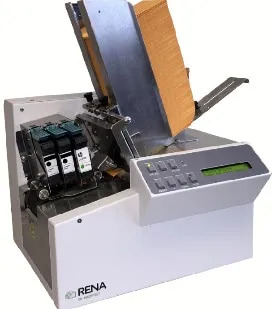 The Rena AS-150 seed pack / envelope printer has almost, all the same, technology of it’s larger siblings like the Rena Imager 1.5 Plus. It even uses the same HP Print cartridges that come in formulas to allow you to print on any stock like the Rena Easyink Aqueous Plus C9050A / Neopost ASINKAP. Click here for a complete list of compatible inks. The Rena AS-150 features an easy to use menu system with a display for quick access to menu features. In the menu, you can clear the batch counter, set it to purge on the 1st piece and more. You can even turn on Print Enhancement to help keep the print cartridge nozzles from clogging up. The inkjet nozzles positioned between 2 lines of text are rarely used so they tend to clog up. Then suddenly you need to print a g or y and the lower part of the g or y doesn’t print. Turning on the print enhancement feature can reduce or even eliminate this problem.